The varsity attires motivated from “Riverdale” American Television Series which is aired worldwide in January, 2017. 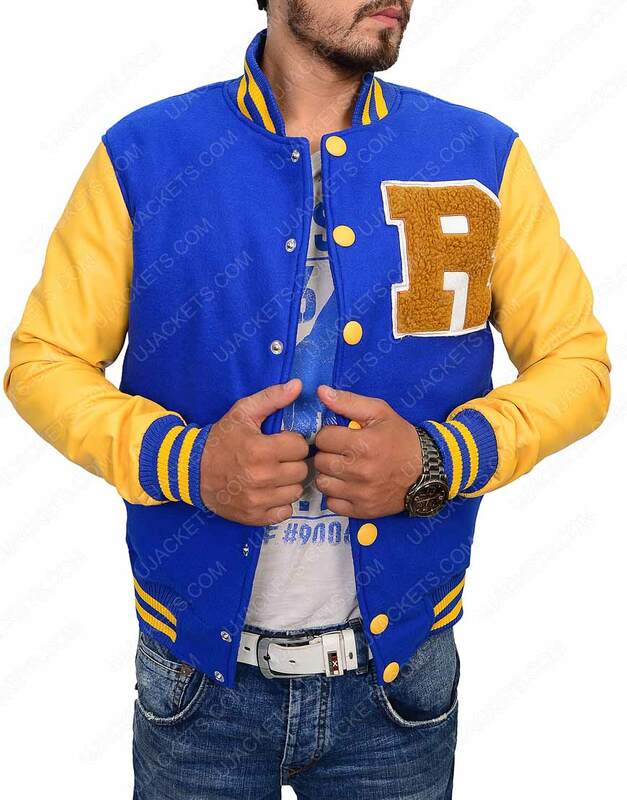 This Riverdale Outfit is worn by Hollywood Television Star KJ Apa for main character of Archibald “Archie” Andrews Jacket is inspired from this television series which is available in various quantities of different sizes for all men who wear this comfortable varsity wears in winters, springs and snowy seasons and also uses in while traveling on bike. Now available in stock of our online store. 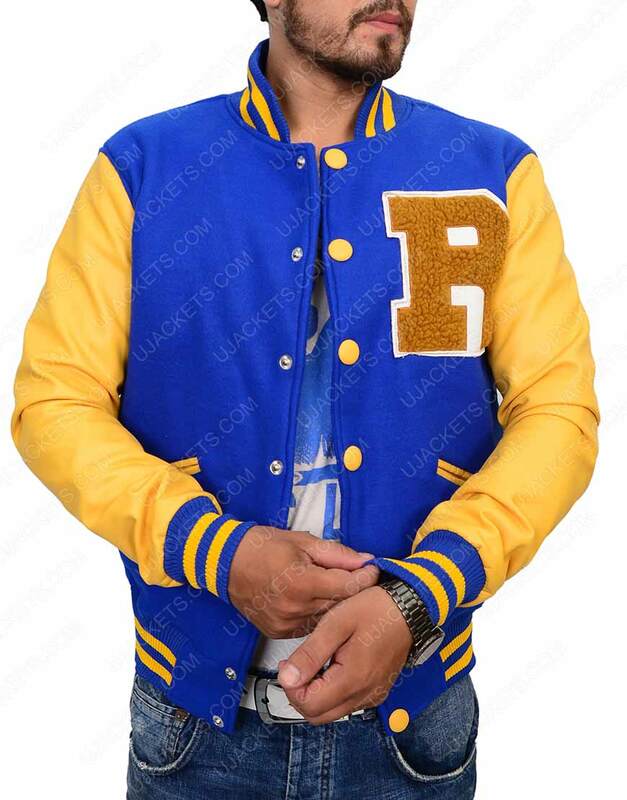 Riverdale Jacket has thru by woolen fabric and PU leather of sleeves with inner viscose lining and Riverdale “R” logo embroidered on left side of chest with front buttoned closure type. 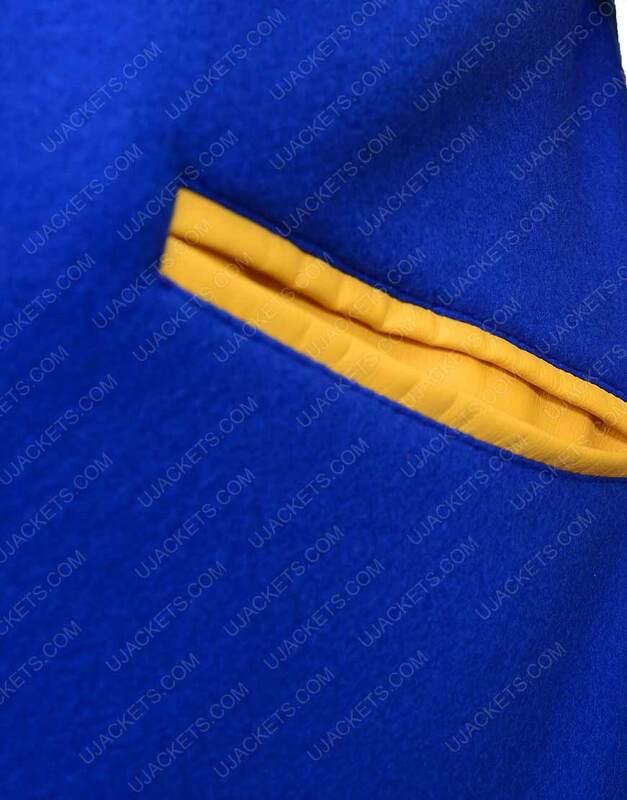 The Rib-knitted collar, cuffs and Hem embossed on this Varsity Jacket with bordered of blue and yellow color and has two slash pockets. Good Genuine Jacket Very clean when it comes to a wool manufactured outfit. I was astonished as soon as I opened my package. Couldn't believe my eyes that what was I getting my hands on to. The detailing was great on this Riverdale jacket and the whole package showed a preserved etiquette showed by the respected company. Everything was topnotch - stitching, buttons concord in a straight line, the blue and yellow shades, the carpet trimmed 'R' logo on the chest is the signature element I can observe on this jacket. Truly an original replica I bought and I'm delighted that I landed on this website. Thanks a lot man!!! I love to wear jackets casually and occasionally both that’s why whenever we decided to go shopping, I definitely avail at least one jacket with my purchase. But this time I was not going to the shopping mall, I visited online websites for the pleasing jacket for my wardrobe. 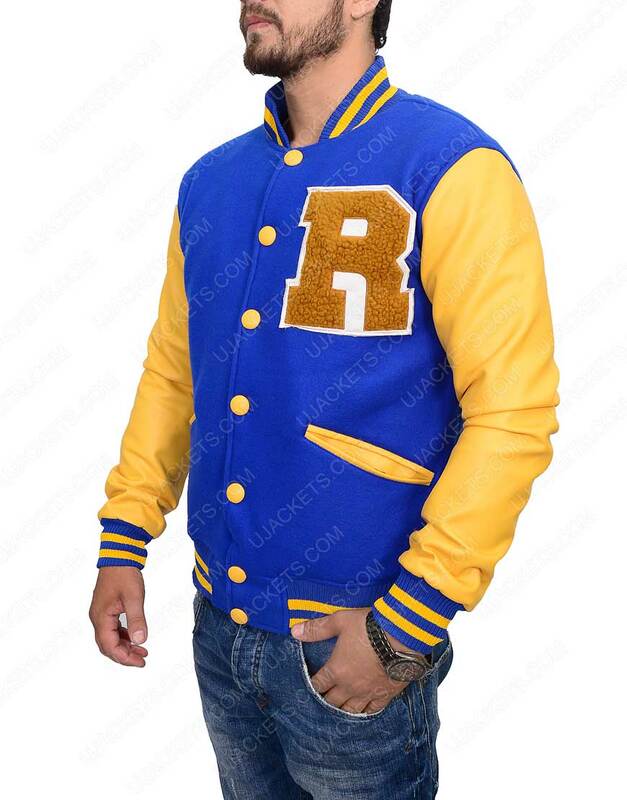 My colleagues were saying that Riverdale Varsity jacket has become famous nowadays and many of the people purchasing it because of its high demand. 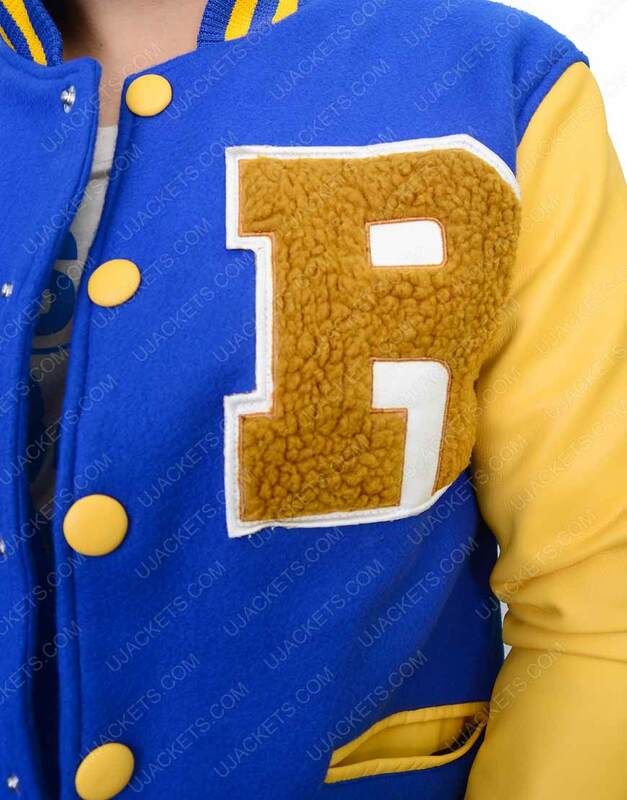 When I checked the picture of this varsity jacket, I was really impressed with its color and style. After some research, I ordered this jacket according to my size that can fit me well. Within 2 weeks, I received my product and I must say that it is the great purchase for me. The color of the attire and its design feels attractive and it was looking good on me. I was really inspired by this site and its products. I would definitely buy again from this site and also recommend to everyone that before visiting any other site, try moviesjacket.com first. Exclusively crafted outwear with intrigued quality I recently bought this outfit from here, and i must say that it is one of the best outwears i have ever found online. The diligent crafting of the garb makes it highly exquisite to attire on, and gives perfect bold presence to the personality which i was looking for. Surely the best outfit to have in such cheap price, with such riveting fabrication. Perfect outwear for casual and formal takeover Being a huge fan of Archie Andrews, i was curiously searching for his riveting outfit that he took in the movie. But despite of searching widely over the internet, i couldn't find one adequate outfit matching to that class. Until i found this apparel here, which is made with same intriguing designing and fabrication which i was in need of. 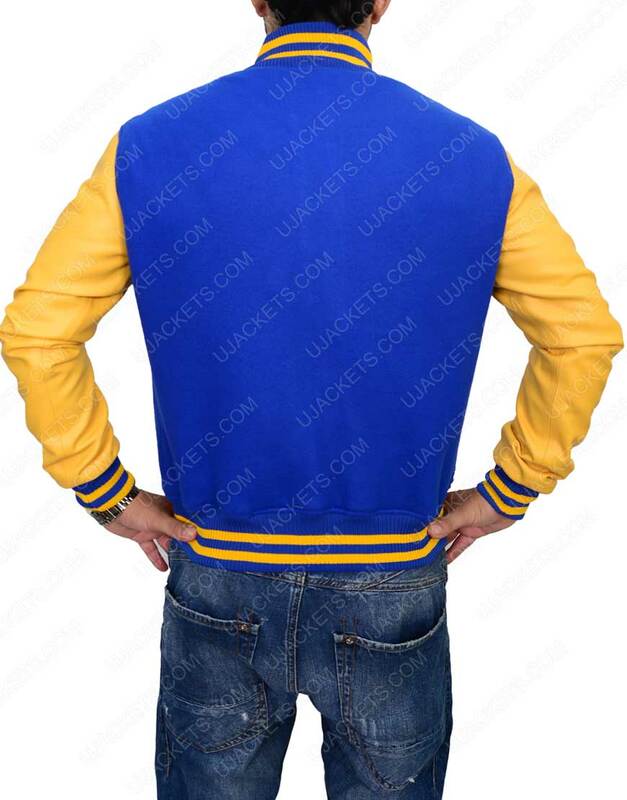 Certainly the best outfit i have found online, and will recommend to all to have this in their wardrobe if they really want to gimmick the perfect style of Archie Andrews. Riveting outfit to make you look extravagant Riverdale is surely one of my most watched television series in recent times, and Archie is my favorite character in it whose styling and bold persona have always allured me. That is why i had always wanted to take on his riveting attire to imitate like him in the same profound style. And this outstanding apparel is exclusively according to that. As from its stagnant facade designing to bold overall tailoring, the outfit standsout completely in all traits and is surely one of the best i have ever found over the internet. Fits good and looks amazing. Fits good and looks amazing. The greatest thing about this attire is I like its the R log with its significance of the Riverdale. As it inspires from Archie comics I love it the way it has been fabricated with Leather Sleeves while the rest of the outerwear is woolen material which is simply and perfectly awesome. I am wearing this gear in Medium size which fits good and looks amazing.